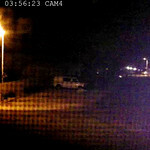 Here's 10-second video of security camera footage at our home in Ahwatukee (Phoenix near I-10 and Elliot). The meteor isn't directly visible in either of these, but you can see the sky and ground light up like daylight! 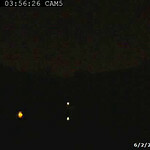 The back yard video faces NNW, and the meteor is off to the right of the screen. The front yard video faces SSE, and the meteor is back over your left shoulder. Then later in the morning, just after sunrise -- around 5am -- this strange "cloud/squiggle" was in the sky. Taken from the area of Washington and Priest, facing north.